"Of course it's happening inside your head, Harry, but why on earth should that mean that it is not real?" So many people are hearing about this book, picking it up, and realizing that getting through the first 80 or so pages is like trying to hold on to Proteus when he’s changing from a greasy pig to a wet seal and back again. (We’re reading the Odyssey in English right now-that should be enough of an explanation for my choice in metaphor.) But believe me when I say this: putting the time in to get through the beginning of this book is worth it. When I like a book, I tend to expect everyone else to like it too. But I do realize that people have different tastes, and that is exactly why I am so set on advertising this book to you all. I have never read another book that is so in tune with the interests of so many different people. There is something for everyone; if you're a fan of, say, Freakonomics and Superfreakonomics or The Economist, you'll be instantly taken in by the details of the Swedish financial history. If you're reaction is, "Boring. Where's the girl with the dragon tattoo?" Just you wait. There's drama, vengeance, murder, mystery, romance, money stealing, tattooing, and a lot of hacking. There are rogue forces taking on thieves, killers, and corrupt, power hungry, filthy rich people. Like I said, something for everyone. If you don’t happen to be interested in any of that, well, all I can do is pity you and your sad, extremely boring life. By the way, I am by no means telling you this is the best book in the universe. But it was entertaining, and sophisticated at the same time, I really liked it, wasn't my absolute favorite, but I liked it, and I think other people will too. The Girl With the Dragon Tattoo (the first in the Millennium Trilogy) has been sitting on my mental bookshelf in the ‘favorites’ section for at least a year now. 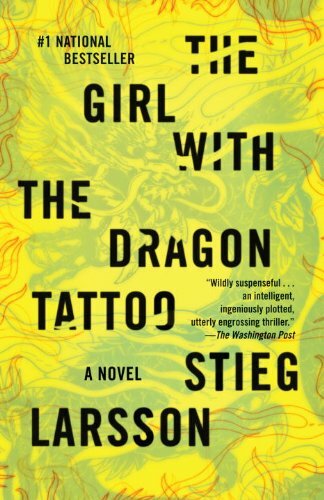 I read the book last year, declared my love of Stieg Larsson to the world (which probably isn't the best idea considering he died in 2004), raved about it for the rest of the month, read The Girl Who Played With Fire in a day, raved about that too, and then shelved it in the back of my head, and there it has been sitting ever since. But now, thoughts of this gruesome but captivating thriller have once again have begun plaguing me. Why is this? One, I recently finished the third and final book in the trilogy, The Girl Who Kicked The Hornets Nest. Two, I discovered that Hollywood is on the way to creating a movie for The Girl With the Dragon Tattoo. Three, I have also discovered that a Swedish version (called Män Som Hatar Kvinno) of the movie already exists, and I am now vigilantly trying to get my hands on the movie, as well as the time needed to watch it. The Guest: What Happened to Daru?